More comic chills are on offer as Playtech’s favourite witches get another outing on their broomsticks in Halloween Fortune II. The 5 reel, 25 payline horror-themed game comes with a bonus feature that awards 10 free spins, complete with a frozen wild and expanding multiplier. Try and cook up a cauldron full of coins from between 25p and £250 per spin. As in the first Halloween Fortune video slot, a trio of glamorous witches are the stars of the sequel – they can appear fully stacked on any reel and can deliver some impressive rewards. The trio of sorceresses are joined on the reels by assorted potion bottles, a crow, a black cat and a candle-filled skull. Land 5 skulls on a payline for a 1,000 coin payout. The Halloween pumpkin is the game’s wild, substituting for all other symbols bar the scatter – it can be lucrative in its own right too, awarding a bumper haul of 3,000 coins for a 5 symbol combo. The Halloween Fortune logo is the game’s scatter – land 3 or more of them anywhere on the reels and you’ll trigger the Free Games feature and with it 10 free spins. The free spins come with some tidy extras, starting with a wild pumpkin that’s placed slap bang in the middle of the reels for each and every free spin. There are plenty of opportunities to boost your wins with multipliers too. To start, all payouts are doubled – after every second spin, that multiplier increases by 1 so on your third and fourth free spins the multiplier will be 3x, on spins 5 and 6 its 4x and on free spins 7 and 8, it’s 5x. The last 2 spins will each be boosted by a 6x multiplier. Unfortunately, it’s not possible to re-trigger any more free spins. The original Halloween Fortune was a fine looking slot and the sequel maintains those high standards – the imagery is top notch, complemented by a deliciously creep backing track than matches the comic horror-theme. 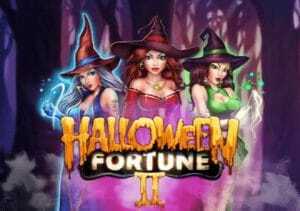 Halloween Fortune II is a worthy successor to a very popular original. The chief attraction is the bonus feature obviously but it’s not the easiest to trigger, However, with a possible concoction of stacked symbols, sticky wild and expanding multipliers, it means this slot can certainly live up to its name and deliver a Halloween Fortune.